The sad truth about the Florida (and US) marketplace today is that caffeine-filled energy drinks are being marketed and sold to children, teenagers, and young adults, even though it’s pretty much understood among experts and those dealing with personal injury claims based upon victims drinking these products that these extremely popular energy drinks are flat out dangerous for young Americans. Based on our own research and our review of the published literature cited herein, we conclude that there is no general consensus among qualified experts that the addition of caffeine in the amounts used in energy drinks is safe under its conditions of intended use as required by the GRAS standard, particularly for vulnerable populations such as children and adolescents. On the contrary, there is evidence in the published scientific literature that the caffeine levels in energy drinks pose serious potential health risks, including increased risk for serious injury or even death. We therefore urge the FDA to take prompt action to protect children and adolescents from the dangers of highly caffeinated energy drinks, including applying the existing GRAS standard for sodas to energy drinks and other beverages that contain caffeine as an additive. We also urge the FDA to require that manufacturers include caffeine content on product labels. Right now, the Food and Drink Administration is very aware of injuries and deaths allegedly caused by someone drinking energy drink products. 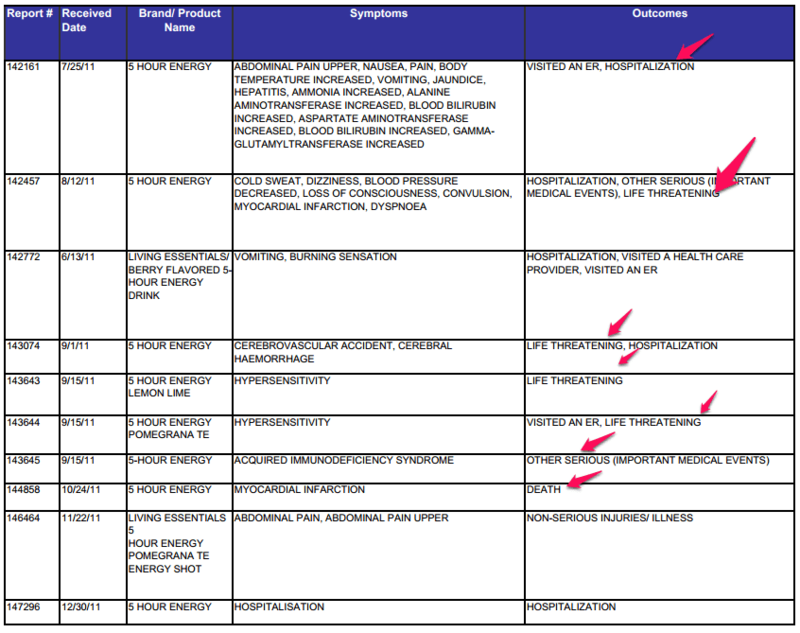 In fact, in October 2012 the FDA published its list of “adverse reports” dealing with energy drinks in its Electronic Reading Room, a list that goes back to 2004, which includes the following entries (there are many more pages in the report) — notice the pink arrows, which are pointing to instances of “life threatening” or “death” as the outcome. 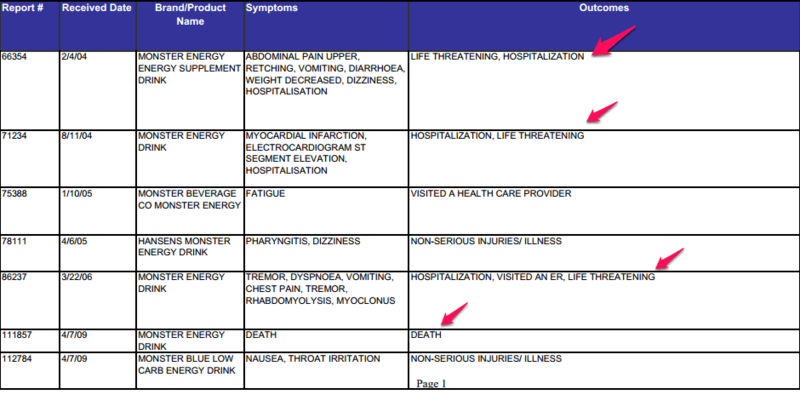 What we’ve shown here are screenshots of two single pages in the FDA Report on Energy Drinks, where complaints about bad things happening after someone drank an energy drink have been recorded for almost ten years now. 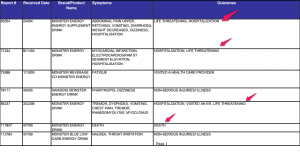 We’ve added those pink arrows to point out how commonplace serious injury and death are listed as “outcomes” in these complaints to the FDA. Still, the manufacturers place these dangerous products into the marketplace and promote them to young people as something for them to buy and use. 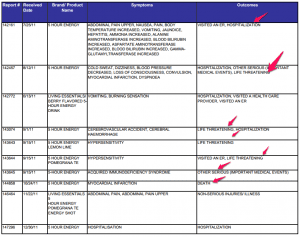 It’s up to all of us to warn each other about the true risks of these products — and for those injured or killed by an energy drink, the forum that seems to be most likely to take their tragedy seriously seems to be the product liability courtroom right now. More and more lawsuits are being filed because of serious injuries or wrongful death caused by an energy drink. Let’s hope that neither you nor anyone you love or care about becomes a victim of these dangerous drinks. A good piece of advice if you have been affected by a wrongful death caused by energy drinks, is to at least speak with an experienced personal injury lawyer before you file a claim to learn about some of the issues that can arise with these claims, including the type of evidence needed to prove a claim and the type and amount of damages you can recover. Most personal injury lawyers, like Alan Sackrin, will offer a free initial consultation (over the phone or in person) to answer your questions.